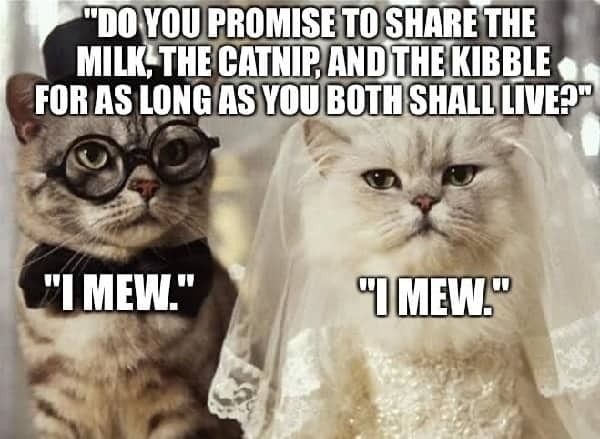 Romantic, loving, sweet, joyous… bring a little humor into the marital scene with these funny wedding memes! 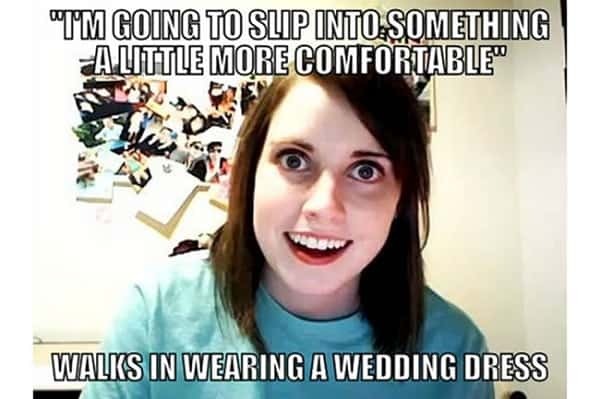 There are way too many brides and grooms joke out there on the internet, and the best ones are found as memes. You can’t miss out on the opportunity to whip some of these out at the right moment, on the big day (or maybe later, if you don’t want to risk facing the wrath of an unimpressed bride). It starts with the prep work. The lead-up to almost any wedding is laced with drama, hysterics, and bridal madness. The whole situation is pretty much begging to become a meme! And the internet rightly responded. 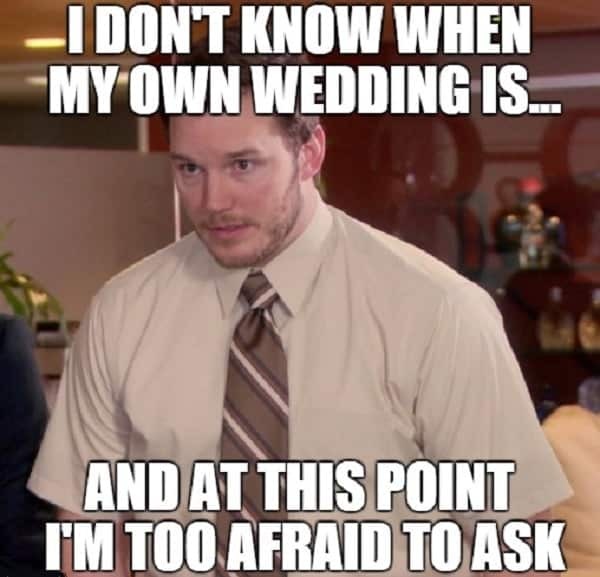 There are endless wedding memes about what goes on during the lead-up to the big day, on both the bride’s side and the groom’s, as well as the behind the scenes work with the bridal party too! Then, of course, the momentous wedding day arrives. Yet again, so many opportunities for humor and amusement. From the ceremony through to the staged photography sessions to the drunken highs of the reception, highlighted of course by the speeches, the wedding day is one to never be forgotten. 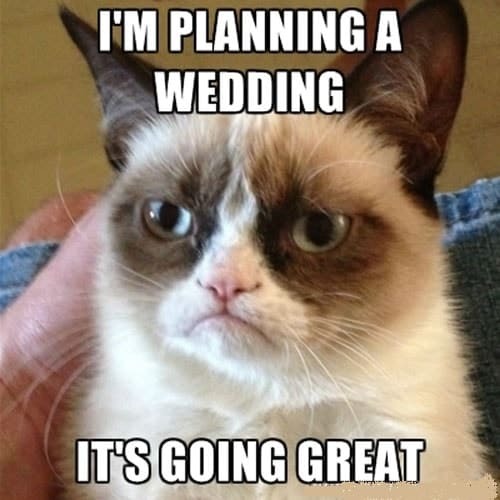 Check out these memes about wedding day to see what we mean. 1. I Don’t Know When My Own Wedding Is… And at This Point, I’m Too Afraid to Ask. 2. 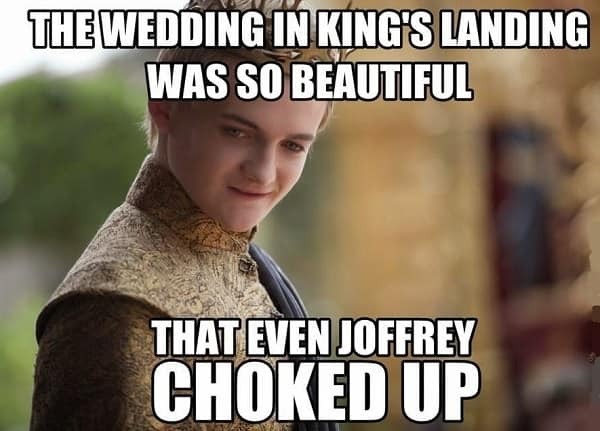 The Wedding in King’s Landing Was So Beautiful That Even Joffrey Chocked Up. 3. I Just Lost A Really Good Friend. 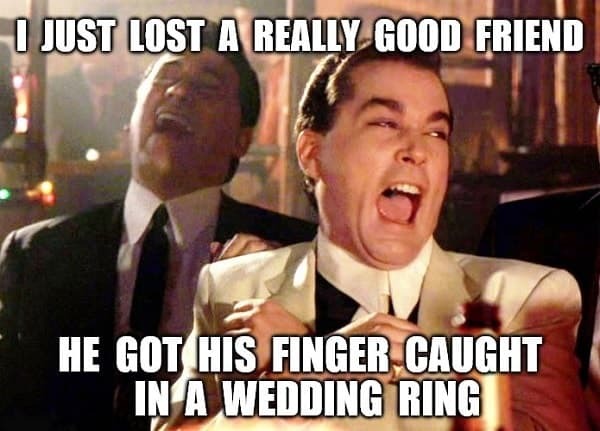 He Got His Finger Caught in A Wedding Ring. 4. Brace Yourself. 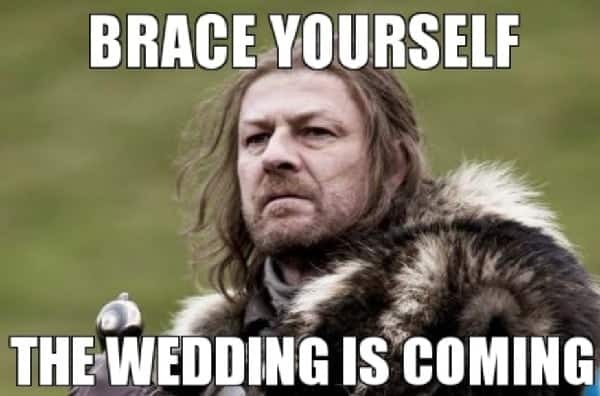 The Wedding Is Coming. 5. Get Excited. It’s Your Wedding Day!!!!! 6. 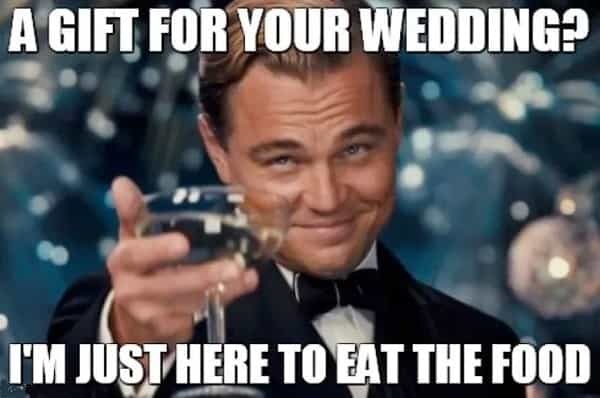 A Gift for Your Wedding? I’m Just Here to Eat The Food. 7. Go to A Wedding They Said It Will Be Fun They Said. 8. 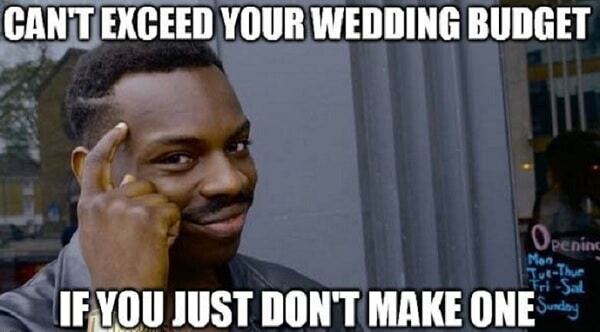 Can’t Exceed Your Wedding Budget. If You Just Don’t Make One . 9. 16th Wedding Anniversary. 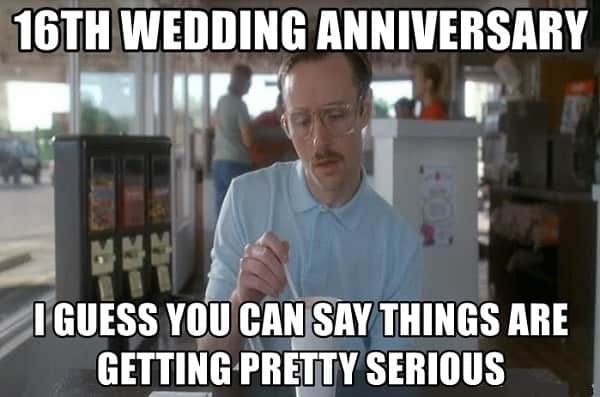 I Guess You Can Say Things Are Getting Pretty Serious. 10. 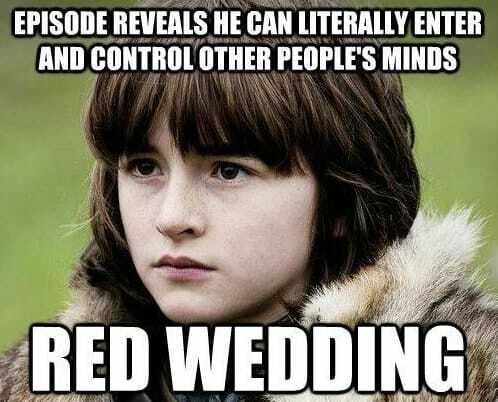 Episode Reveals He Can Literally Enter And Control Other People’s Minds. 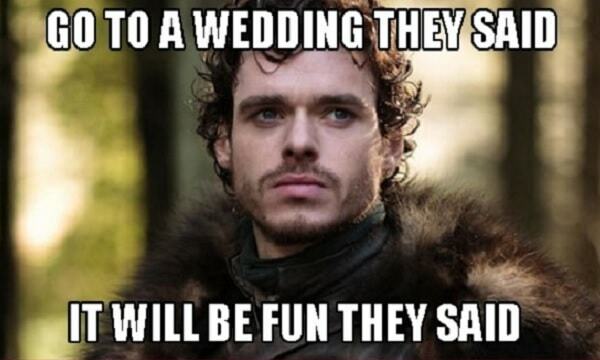 Red Wedding. 11. You Have Bought Yourself Something? 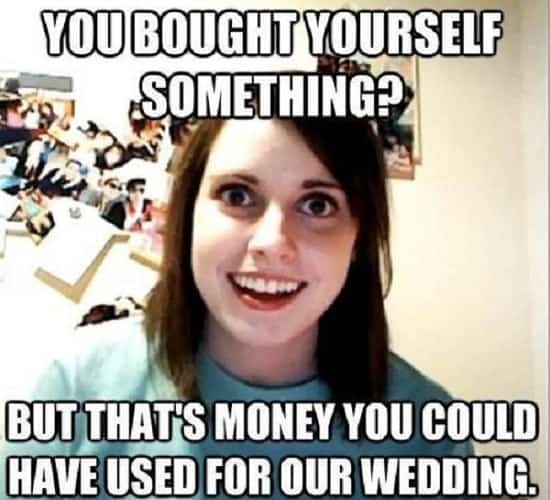 But That’s Money You Could Have Used for Our Wedding. 12. 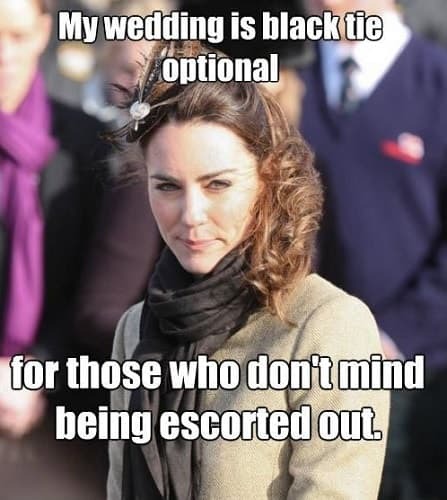 My Wedding Is Black Tie Optional for Those Who Don’t Mind Being Escorted Out. 13. 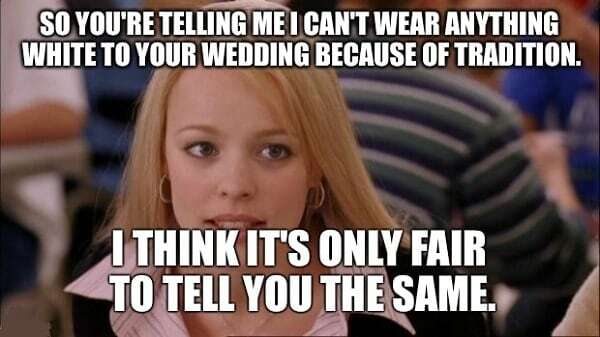 So You’re Telling Me I Can’t Wear Anything White to Your Wedding Because of Tradition. I Think It’s Only Fair to Tell You The Same. 14. 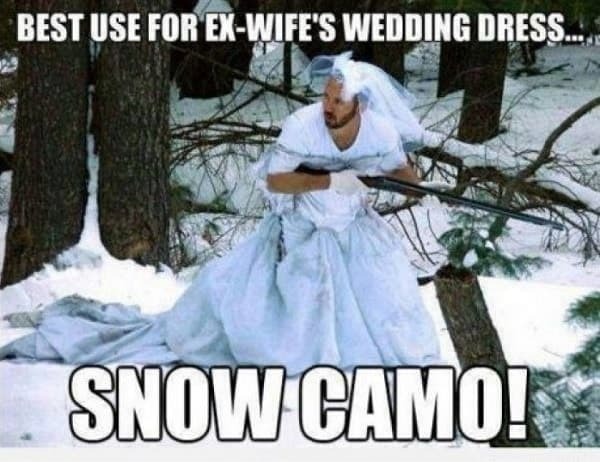 Best Use for Ex-wife’s Wedding Dress… Snow Camo! 15. 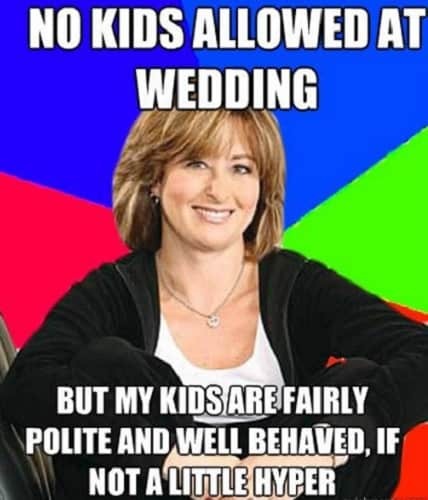 No Kids Allowed at Wedding. But My Kids Are Fairly Polite And Well Behaved, If Not A Little Hyper. 16. Yesterday Was My Wedding Anniversary. 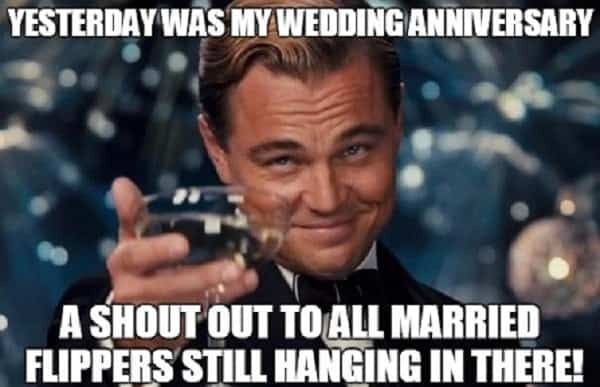 A Shout Out to All Married Flippers Still Hanging in There! 17. Congrats on Your Wedding Anniversary. 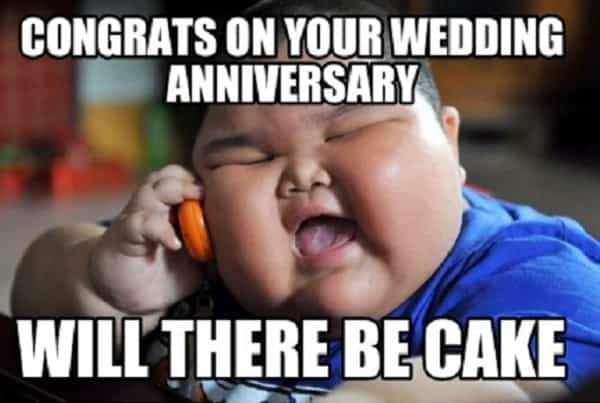 Will There Be Cake? 18. 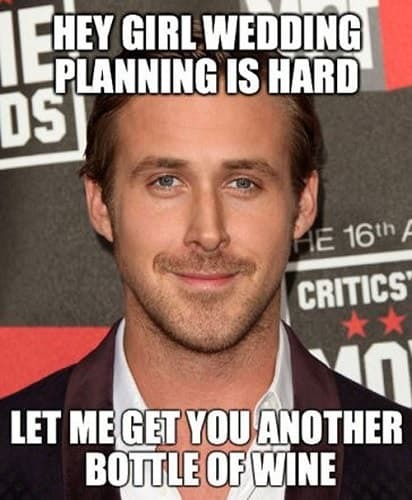 Hey Girl Wedding Planning Is Hard. Let Me Get You Another Bottle of Wine. 19. 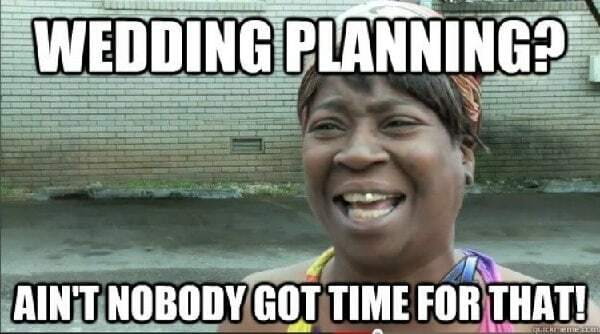 Wedding Planning? Ain’t Nobody Got Time for That! 20. 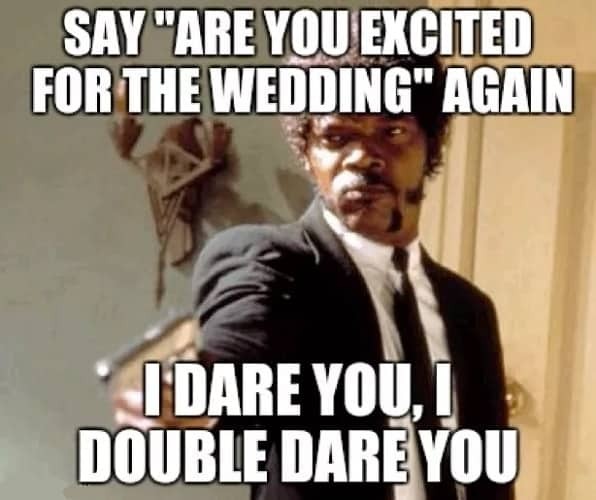 Say “Are you Excited for The Wedding” Again. I Dare You, I Double Dare You. 21. “I’m Going to Slip into Something A Little More Comfortable”. Walks in Wearing A Wedding Dress. 22. Wearing White to A Wedding And You’re Not The Bride? 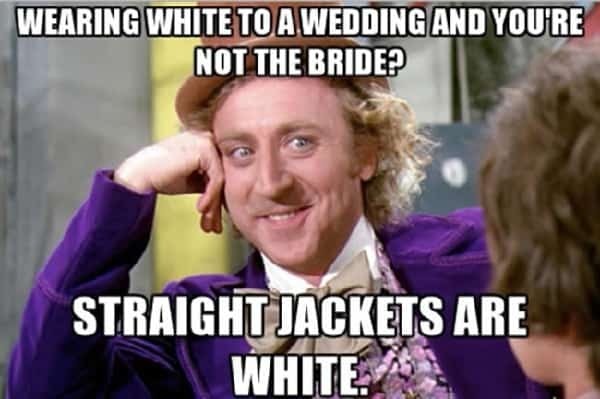 Straight Jackets Are White. 23. 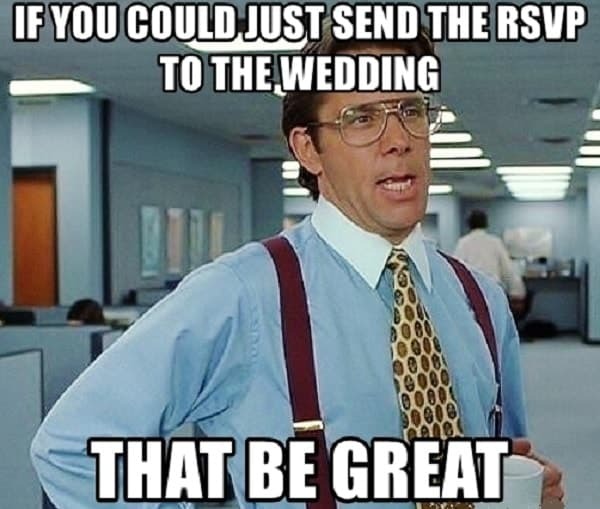 If You Could Just Send The RSVP to The Wedding. That Be Great. 26. 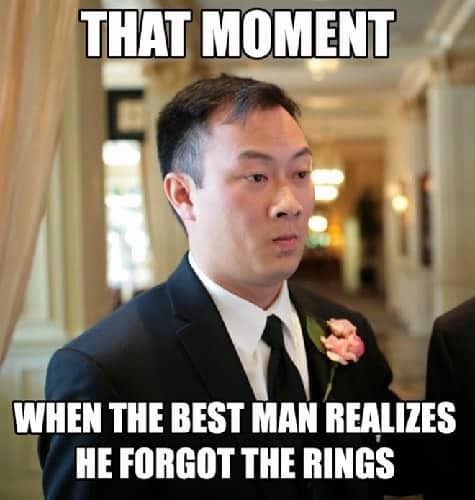 That Moment When The Best Man Realizes He Forgot The Wedding Rings. 27. 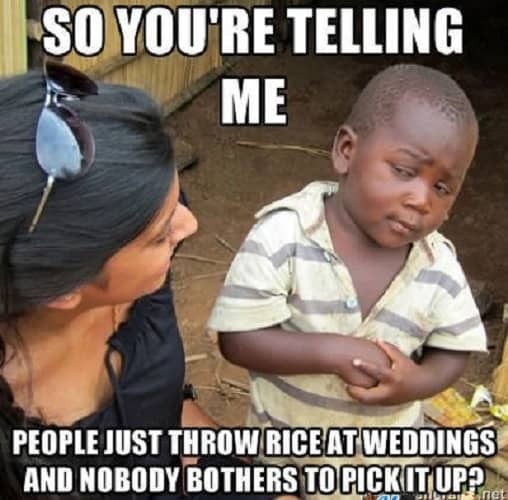 So You’re Telling Me People Just Throw Rice at Weddings And Nobody Bothers to Pick It Up? 28. I’m Planning A Wedding. It’s Going Great. 29. A Wedding Ring Is The Smallest Handcuff Ever Made. 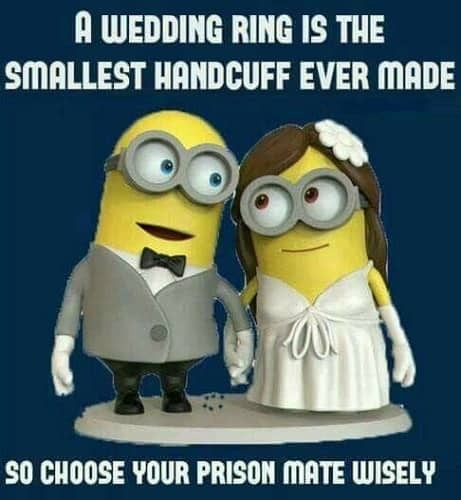 So Choose Your Prison Mate Wisely. 30. 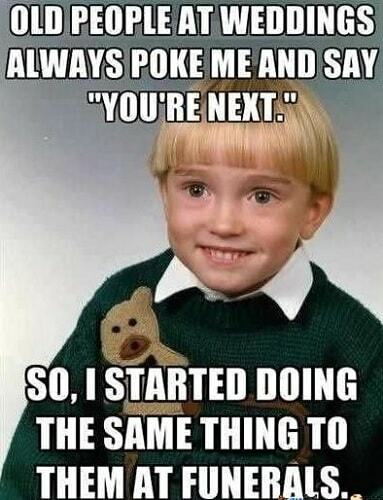 Old People at Weddings Always Poke Me And Say “You’re Next.” So, I Started to Doing The Same Thing to Them at Funerals. 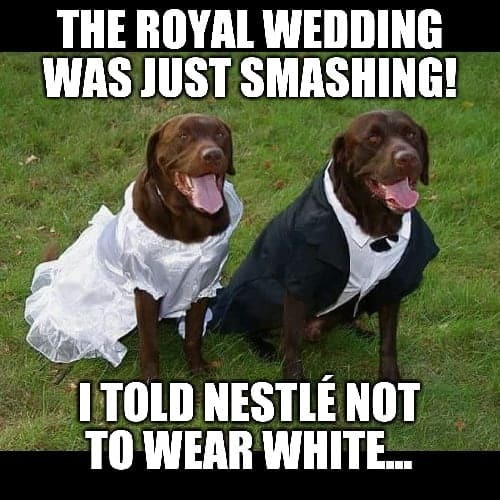 Marriage is a commitment not taken lightly, but funny wedding memes, on the other hand, are a perfect way of shedding some humor onto the big day! From bride and groom dramas to the classic wedding stereotypes, these memes are perfect for all wedded couples.